The profile configuration area features a set of controls to select the appropriated input and output protocols, to reassign buttons mappings and to adjust the sensitivity. 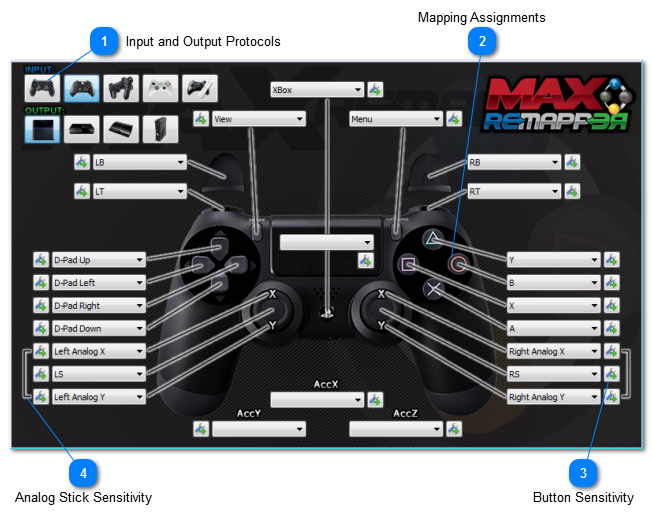 With the MaxRemapper plugin open all changes made in the profile configuration take effect instantly, allowing you check and test all remaps and sensitivity adjustments on-the-fly, either directly while playing a game or in the Device Monitor. The controller shown in the center is actually representing the output protocol (console). The input entries (controller) are available in the combo boxes around the controller picture. Any configuration should start with selections of the input and output protocols. • INPUT: The input protocol represents the controller you pretend to use and it will determine the available inputs in the combo boxes around the controller picture. The options from left to right are: Dualshock 4, XBox One Controller, Dualshock 3, XBox 360 controller and the Wiimote/Wii U Pro controller. • OUTPUT: The output protocol represents the console you pretend to use and it will determine controller picture on the center area. The options from left to right are: Playstation 4, XBox One, Playstation 3 and XBox 360/PC. For example: assuming you have selected XBox 360 controller as INPUT and Playstation 3 as the OUTPUT. If the combo box associated with the “TRIANGLE” button on the controller image is showing the “A” this means that the action of pressing the “A” button on your XBox 360 controller will be converted to the action of pressing the “TRIANGLE” button for the Playstation 3 console. The MaxRemapper allows you to perform any kind of remapping, without exceptions. For example, it is possible to remap the entries of the motion sensors of a Dualshock 4 or Dualshock 3 controller to the XBox One or Xbox 360 analog sticks or the Wiimote infrared sensors to the analog sticks, or even to remap a single input for multiple outputs. This makes it possible to play racing games with the Dualshock 4 or Dualshock 3 motion sensor on Xbox 360, play bowling games with the Wiimote, and play FPS games with the Wiimote+SensorBar “Point and Shoot” feature. The mapping assignments (remappig) procedure is very simple and intuitive. Just select the desired input value in the combo boxes for each output button, analog stick or sensor, as illustrated in the picture. Remember, the combo box represents your controller and the central picture your console. The action of of pressing the button you choose in the combo box will be converted to the output button associated with the combo box. The entries that represent variation of value according to the pressure applied on the button allow the adjustment of sensitivity. These settings can be accessed by clicking on the button next to each controller combo box. The sensitivity adjustment is performed by a percentage factor. For example, a factor of 50% means that the output value will be 50% of the input value. A factor of 200% means that the output value will be 200% of the input value. 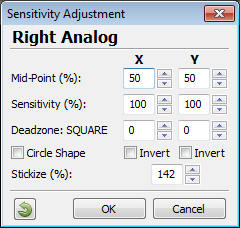 The default value is 100% meaning that no adjustment on sensitivity is being applied. In some situations it may be desirable to always have the maximum value in a given output, independently of the input value. This behavior can be selected in the sensitivity settings by activating the option “Set 100% for any input value”. The sensitivity adjustment on the analog sticks are a special case. The adjustment is made on the pair (X, Y) in order to allow a more advanced configuration. This makes it possible to have a more precise control of the values translation ​​from other sources such as motion sensors, IR sensors, or the FragFX mouse controller for the analog stick. If you configure this parameter with 80 you are defining a zone of low sensitivity when close to the rest position (better accuracy), and a zone of high sensitivity when far from rest position (fast movements). • Sensitivity: This is the angular adjustment, the value is multiplied to the current value of specified entry. 100 means multiply for 1, 143 means multiply for 1.43, 72 means multiply for 0.72, e.g. : if you enter 100% this means your output will be equal to your input for that button or analog stick. Entering 143% means your output will be equal to 143% of the input value (greater than). Entering 72% means your output will be equal to 72% of the input value (less than). • Deadzone: Adjust the deadzone for the specific analog stick. The default deadzone shape is SQUARE but it can be changed to a CIRCLE shape. In this case the radius value of the CIRCLE deadzone is set in the Y field. • Invert: Invert the direction of the analog stick axis. If activated, pushing the stick UP will result in a DOWN value. The same applies to the X axis, if invert is activated, pushing the stick LEFT will result in a RIGHT value. • Stickize: Converts the values of Wiimote IR sensor (or mouse) input to match the circle area of the analog stick. The possible values ​​of the analog sticks are usually confined to the area of ​​a circle, being impossible reach the maximum values ​​in the diagonals. Some rare games try to fix it, which results in much more sensitive diagonal movements. In this case, the sitickize setting can be adjusted to cancel this effect. Usually this setting can be left at its default value, the only game that we know to require this adjustment is Battlefield Bad Company 1.